By Order Of The High Sheriff! It's not every day that we undertake a commision for a uniform. But we were thrilled to be asked to design and create the uniform for The High Sheriff of Staffordshire. It was a real treat to go back to researching the origins of Court Dress, and to develop ideas that would make the uniform traditional, but very flattering too. Court Dress originates from the elaborately decorated clothes worn during the reign of George III, with coat and breeches of fine cloth worn with an elaborately embroidered waistcoat, just like the ones made by the mice in Beatrix Potter's Tailor of Gloucester! But in an attempt to standardise dress in 1869 the Lord Chamberlain’s office issued new guidelines for a more sombre form of Court Dress that is still worn today. "The colour should be black or a dark colour such as navy, plum or bottle green and in velvet, heavy silk or worsted cloth. It should have the traditional elements of lace jabot, matching lace cuffs, dark matching hat with white (ostrich) feather(s), traditional steel-cut buttons at the front and smaller ones on the cuff, buckles on the shoes and white gloves." Designs were drawn, patterns were cut and toiles were finalised. 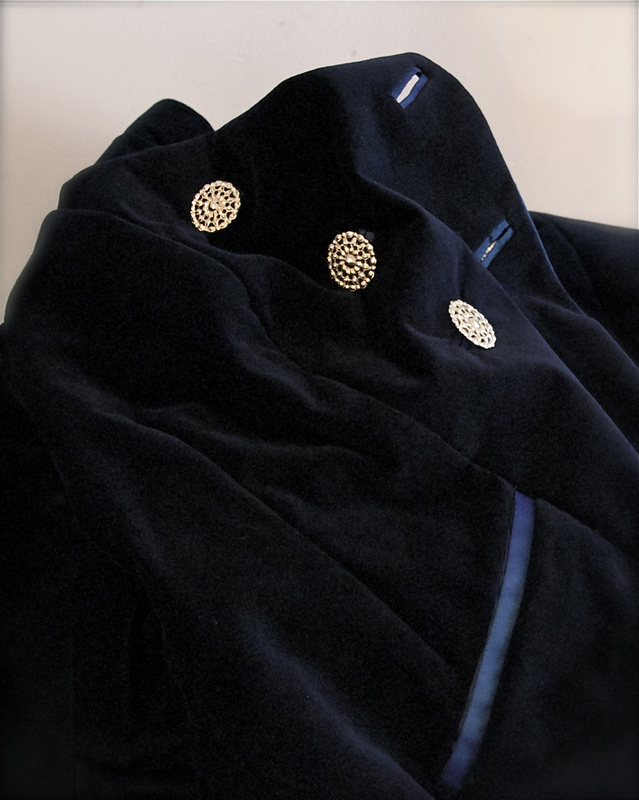 Velvet was sourced from Bradford and silks from Leeds. Anna and I set about stitching and tailoring and piping and binding. So here is our contemporary High Sheriff in the uniform that's worn to greet Royal visitors to Staffordshire and at Court and Civic events. Very elegant, very Sarah Willard Couture and made to order in Staffordshire!